Press freedom is still under threat in Poland. The case of TVN24 journalist, Wojciech Bojanowski, who revealed a police torture case last year, is one of the most striking examples of the Polish state’s control of the media. EURACTIV’s partner Gazeta Wyborcza reports. 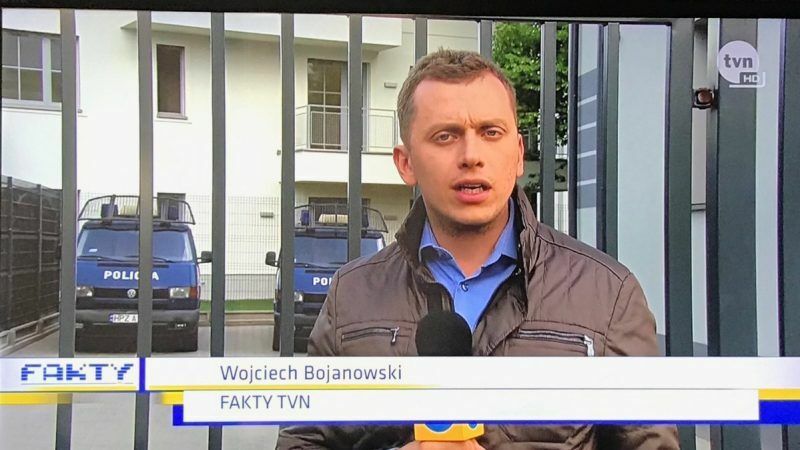 A year ago, TVN24 journalist Wojciech Bojanowski revealed that police had repeatedly used a taser against 25-year-old Igor Stachowiak in the Wrocław police station. The repeated use led to his death, which sparked outrage all over Poland. A year later, what is the outcome? None of the police officers have suffered consequences but Bojanowski now faces problems with the prosecutor’s office. The TVN24 journalist accessed a recording of the police which became a key piece of evidence in the case, as it shows the police officers torturing Stachowiak. Meanwhile, the prosecutor’s office is tirelessly looking for Bojanowski’s source. At the end of last year, the prosecution persuaded the court to release Bojanowski on the promise of confidentiality in regard to the case. Nonetheless, the journalist refused to reveal his source. It recently emerged that the prosecutor’s office also questioned his parents about the case. Bojanowski’s recording revealed incredible anomalies within the police, which led to the journalist being awarded the most important journalistic prize in Poland last year. However, it is hard not to take the prosecutor’s office’s actions as a warning to other journalists: if they tackle similar topics, they will encounter problems. At the very least, investigators will brutally intrude into their private lives. The latest information on Bojanowski came a week after the announcement of Freedom House’s latest rankings of press freedom, where Poland has again fallen by four points. Since PiS took power in October 2015, Poland has slipped 40 places in the rankings. Freedom House estimates that at the moment the media in Poland is in a similar situation as in Fiji or in the Dominican Republic. At one point, Poland was at a similar rank as Canada – which of course does not mean that there were no problems in the past, under the previous government, like the raiding of the editorial office of the Wprost weekly by the special services and an attempt to seize materials relating to bugged conversations between some of the country’s most important politicians. PiS targeted the media from the word go. Less than two months after coming to power, PiS took control of the public media, reducing the number of journalists (over 200 people were let off) to increase the role of propagandists. Information on state television and radio has become completely one-sided, they praise the ruling party, demonise the opposition, talk about the growing power of Poland and show the West, especially France and Germany, as being in crisis. Donald Trump invariably receives the acclaims of the public media, while German Chancellor Angela Merkel, French President Emmanuel Macron and the European Commission’s Jean-Claude Juncker and Frans Timmermans are blamed for all the calamities Europe has to face. News programmes on Polish state television are similar to broadcasts in Russia, with similar propaganda methods. When Beata Szydło was replaced by Mateusz Morawiecki as prime minister in December last year, it was announced that the new head of the government would stop propaganda in public media, but no such thing has happened. Private media were also affected. Last summer PiS politicians announced a “re-polonisation” of the media – that is, taking away Polish media from foreign companies, or at least reducing the latter’s ownership. The party argues that foreign (mainly German) owners, acting on the orders of their own governments, compel Polish journalists to attack the Polish government, an absurd conclusion that has taken root among the PiS electorate. I have frequently heard that I am not a Polish journalist but rather a “Polish-speaking” journalist at best. Attacks by PiS politicians on free media resemble Donald Trump’s admonitions to CNN or the New York Times. It was, oddly enough, the actions of the Trump administration that persuaded PiS politicians that media re-polonisation was not a smart idea. In December last year, the National Broadcasting Council imposed a PLN 1.5 million fine (€350.000) on TVN24 for what it said was biased coverage of protests in front of the Polish parliament that took place in 2016. TVN24 is a constant thorn in PiS’s side – a large nation-wide television news channel that does not spare anyone, including those in power. It belonged to the American group Scripps, and became part of the Discovery group following its takeover. It is unofficially known that the PiS tried to persuade the Americans to sell it, avoiding the re-polonisation of the station. When they refused, the National Broadcasting Council became involved, using the professional advice prepared by an expert sympathetic to PiS. The US State Department reacted immediately to the fine imposed on TVN24, recognising it as a threat to freedom of speech. The penalty was withdrawn and the topic of media re-polonisation disappeared. But this does not mean that the situation has returned to normal. Media that are not favourable to the Polish government are plagued by actions initiated by state-owned companies. The CEO of one of them demanded, for example, that the security services check whether the author of unfavourable articles was not a German agent. The case of Wojciech Bojanowski shows how much of a threat actions led by the prosecutor’s office (controlled by the government) can be to media freedom. The picture is completed by a policy of cutting off media from information and the termination of subscriptions and withdrawal of advertisements by the government and subordinate institutions. For two years now, the Polish authorities have been trying to intimidate independent journalists and starve them of funds. But we are still here and we do our job. However, it would be good if the European Parliament and other EU institutions would take an interest in the fate of Polish journalists. After two years of PiS rule, I can’t be sure that the situation in my country will not change for the worse.